NEW YORK, April 9, 2019 – Associated Press National Player of the Year Megan Gustafson of Iowa, Mississippi State center Teaira McCowan and Notre Dame guard Arike Ogunbowale headline the list of 12 prospects who will attend WNBA Draft 2019 presented by State Farm® on Wednesday, April 10 at the Nike New York Headquarters. ESPN2 will air the first round beginning at 7 p.m. ET, followed by coverage of the second and third rounds on ESPNU at 8 p.m. ET. The draft will also stream live on the ESPN app. The other prospects who will be in attendance are center/forward Kristine Anigwe (California), center Kalani Brown (Baylor), forward Napheesa Collier (Connecticut), guard Sophie Cunningham (Missouri), guard Asia Durr (Louisville), guard Katie Lou Samuelson (Connecticut), forward Alanna Smith (Stanford), center Han Xu (China), and guard Jackie Young (Notre Dame). The Las Vegas Aces hold the No. 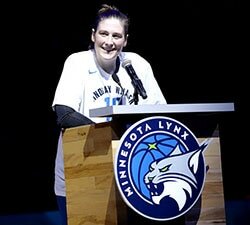 1 overall pick after winning the WNBA Draft Lottery presented by State Farm in August. The New York Liberty will select second. The Indiana Fever has the third selection, followed by the Chicago Sky at No. 4. Here is a closer look at the prospects who will be attending WNBA Draft 2019 presented by State Farm. Kristine Anigwe, California: The 6-4 Phoenix native earned All-America, All Pac-12 and Pac-12 All-Defensive Team honors in each of her four seasons and finished as Cal’s career leader in points, rebounds and blocks. As a senior, she was named the Naismith Defensive Player of the Year, became the first woman in 30 years to average 22.0 points and 16.0 rebounds in a season and set a Pac-12 record with 33 straight double-doubles. In her final regular-season game, she scored 32 points and grabbed 30 rebounds against Washington State. Kalani Brown, Baylor: Brown, who helped Baylor win the 2019 national title, was a two-time AP All-America Second Team selection and a three-time All-Big 12 First Team and All-Defensive Team honoree. She was a finalist for the 2018-19 Naismith National Defensive Player of the Year Award. The 6-7 native of Slidell, La., is the daughter of P.J. Brown, who played 15 NBA seasons and won a championship with the Boston Celtics in 2008. Napheesa Collier, Connecticut: An AP All-America First Team selection this season, Collier helped UConn to four consecutive NCAA Final Four appearances and the 2016 national title. The 6-2 native of O’Fallon, Mo., won the 2018-19 Katrina McClain Award as the nation’s top power forward. She was the American Athletic Conference Player of the Year as a sophomore and senior, and the AAC Defensive Player of the Year this season. .
Sophie Cunningham, Missouri: A 6-1 native of Columbia, Mo., Cunningham led the Tigers to four straight NCAA Tournament berths after the school’s decade-long absence. She earned AP All-America Third Team honors this season, was selected to the All-SEC First Team three times and was a finalist for the Cheryl Miller Award as the nation’s best small forward in each of the last two seasons. Cunningham is Missouri’s career points leader. Asia Durr, Louisville: The 5-10 guard won the 2018-19 Ann Meyers Drysdale Award as the nation’s best shooting guard. As a junior and senior, Durr was named an AP All-America First Team honoree and the ACC Player of the Year. She is the No. 2 scorer in Louisville history. 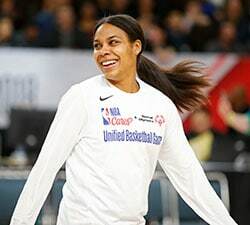 Durr, who grew up in Douglasville, Ga., appeared in a promotional spot for the WNBA’s Atlanta Dream as a 10-year-old in 2008. Megan Gustafson, Iowa: This season, the 6-3 forward/center was a consensus All-American, the Lisa Leslie Award winner as the nation’s top center and the fourth woman in NCAA history to score 1,000 points in a season. The Port Wing, Wis., native earned Big Ten Player of the Year honors in each of the last two seasons, when she led the nation in points per game as both a junior (25.7) and senior (27.8). Teaira McCowan, Mississippi State: A 6-7 center from Brenham, Texas, McCowan was selected as a 2018-19 AP First Team All-American and is a finalist for the 2018-19 John R. Wooden Award and Wade Trophy as the National Player of the Year. She earned National Defensive Player of the Year honors from the Women’s Basketball Coaches Association in 2018-19 and Naismith in 2017-18, and was the SEC Defensive Player of the Year in each of those seasons. McCowan helped MSU reach the national title game as a sophomore and junior. Katie Lou Samuelson, Connecticut: Samuelson helped the Huskies to a national championship as a freshman in 2016 and to Final Four appearances in each of the following three seasons. The 6-3 native of Huntington Beach, Calif., made the AP All-America First Team twice and the American Athletic Conference First Team three times. Her older sister, Karlie, is entering her second WNBA season with the Los Angeles Sparks. Alanna Smith, Stanford: As a senior, Smith earned AP All-America Second Team honors and was chosen to the All-Pac-12 Team and All-Pac-12 Defensive Team. She led Stanford to the 2019 conference tournament title as the Most Outstanding Player. 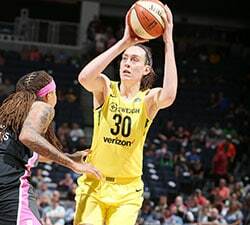 The 6-4 forward from Melbourne, Australia, joined Elena Delle Donne, Maya Moore and Breanna Stewart as the only players in the last 20 years to accumulate career totals of 1,600 points, 150 three-pointers and 200 blocks. Han Xu, China: The 6-9 center could become the first graduate of the NBA Academies program to be drafted into the NBA or WNBA. She spent 2017 at the NBA Academy in Shandong, China, and participated in the Basketball Without Borders Global Camp during NBA All-Star 2018 in Los Angeles. Han, who played for the Chinese National Team at the 2018 FIBA Women’s Basketball World Cup, spent this season with Xinjiang of the Chinese Basketball Association. Jackie Young, Notre Dame: An AP All-America Third Team selection as a junior this season, Young teamed with Ogunbowale and Marina Mabrey to give Notre Dame one of the nation’s top backcourts. In 2018-19, the 6-foot guard from Princeton, Ind., was a consensus All-ACC Second Team selection and the MVP of the conference tournament. She also became the first Notre Dame player to record two triple-doubles in a season. WNBA Draft 2019 presented by State Farm takes place on the same day that single-game tickets go on sale for many teams for the league’s 23rd season, which tips off on Friday, May 24. 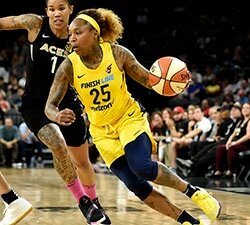 For ticket information, fans can visit wnba.com/tickets or team websites. The players invited to attend WNBA Draft 2019 presented by State Farm® are below.